Soufflés can be fiddly to make, but if you follow this recipe carefully you’ll get great results. Brush the insides of four ramekins with butter. Add a small amount of sugar to each and turn them to coat the sides and bottom, shaking out any excess. Set aside to chill in the fridge. Use a fine grater to zest the lemons – grate the yellow outer skin, but be careful not to grate the white pith underneath (the pith will make the soufflés bitter). Cut the lemons in half and squeeze the juice. Add the zest to the juice and put to one side. Separate the eggs – crack each egg in half and tip the contents between the two shells, allowing the whites to slide through into the bowl beneath while the yolks stay in the shells. Put four egg whites into a large bowl and two of the yolks into a separate small bowl (the left-over egg yolks can be saved for scrambled eggs or custard). Add 6 tablespoons of sugar to the small bowl with the egg yolks. Preheat the oven to 180°C (160°C fan assisted)/350F/Gas 4. Put the baking tray into the middle of the oven. Put the cream, flour and cornflour into a medium-sized bowl and whisk to a smooth paste. Warm the milk in a large saucepan over a medium heat until just boiling. Remove from the heat. Mix the hot milk into the cream, flour and cornflour mixture with the whisk – add a little to start with and mix well until the mixture is smooth like really thick cream. Press any lumps to the side to break them up. Then add the rest of the milk. Pour the mixture back into the saucepan and put it over a gentle heat. Beat vigorously with a hand whisk until it’s thickened. It’s important to keep whisking all the time so that the mixture doesn’t stick. When you feel it thickening, remove the pan from the heat and whisk in the lemon juice and zest a little at a time. The heat of the pan will continue to cook the mixture. Use a wooden spoon to beat the egg yolks and caster sugar together in the small bowl. Beat them into a thick paste. Add this paste to the mixture in the saucepan and mix well until smooth. Put the saucepan back on the hob to thicken again. Whisk until it begins to bubble and then take if off the heat – the mixture should look like custard. Put it to one side to cool before adding the egg whites. Whisk the egg whites in a large bowl using a hand whisk or electric hand mixer. Before you start, make sure the bowl and whisk are completely clean and grease-free, and make sure there’s no yolk with the egg whites or they won’t whip to full volume. Whisk until soft peaks begin to form – the egg whites should look like clouds. When the mixture in the saucepan has cooled you can add the egg whites. Check the temperature of the mixture before you add the egg whites – it should be body temperature or cooler. Add one large spoonful of the egg whites and beat well with the whisk to make the mixture less stiff. Now use a large metal spoon or spatula to very gently fold in the remaining egg whites. Use the spoon to go round the outside and cut through the middle – the aim is to fold in the air bubbles slowly, without breaking them up. Continue until it’s a pale yellow mixture with no streaks of egg white. Fill the ramekins to the brim with the mixture and level off with a spatula or palette knife. Run a thumb nail around the inside rim of the ramekins (this helps the soufflés rise evenly without catching on the sides). Place the ramekins on the baking tray in the middle of the oven for about 14 minutes until risen and turning golden. Don’t open the oven during cooking. 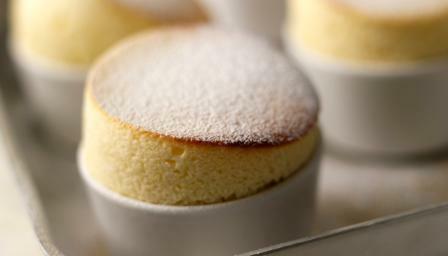 Time and watch the soufflés carefully – take them out as soon as they’ve risen and are starting to go golden. If you’re using smaller ramekins you’ll need to reduce the cooking time by a few minutes (5 or 6 smaller soufflés will need about 10 minutes).